With the flexibility of Relevant Tools it is easy to setup an online registration system for programs, conferences or events. 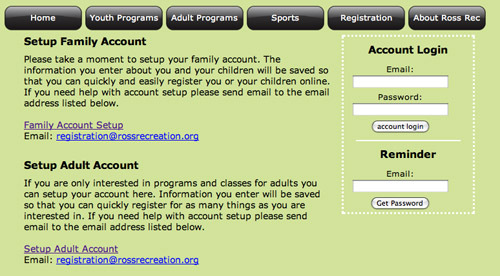 Ross Recreation is using Relevant Tools to handle all program registrations for their enrichment and sports programs for children and adults. The first step is to set up an account so that you can login using User Login, a custom option available from Relevant Tools. The account registration uses standard Relevant Tools web forms to collect the information needed. 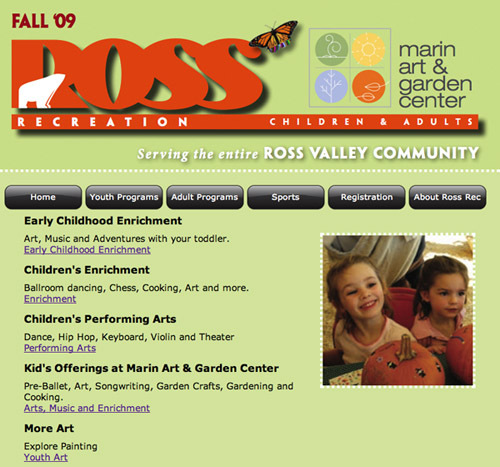 For Ross Recreation there are two registration forms depending on if you are interested in programs for the entire family or if you only want to register for adult programs. The account setup form can be easily customized to collect the information needed for your particular organization. Browse through the list of program offerings to determine what you want to register for. All of the programs are in a Relevant Tools program database that you can easily edit at any time, adding new programs or changing existing offerings. Relevant Tools Custom Reports is used to display the program options. You can specify what information that you want displayed for each program and how you would like it to be presented. When you find a program that you would like to register for you start the registration process by clicking on the registration link. All the information from your account is automatically entered into the registration form. You review the registration form and enter any additional information that may be needed for this particular program. The registrations are all stored in a Relevant Tools Registration database. 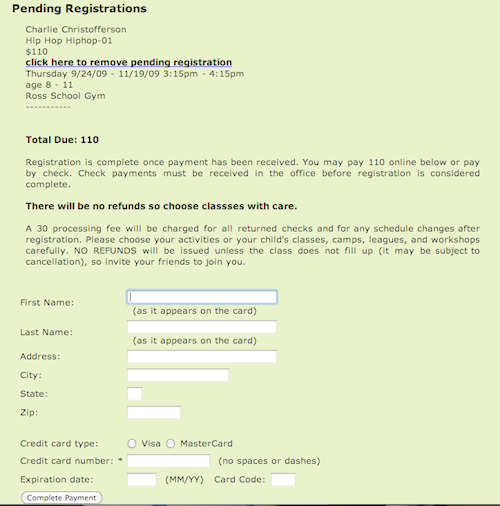 In addition to managing the registration process it is easy to email everyone in your Registration databases with reminders about the program. 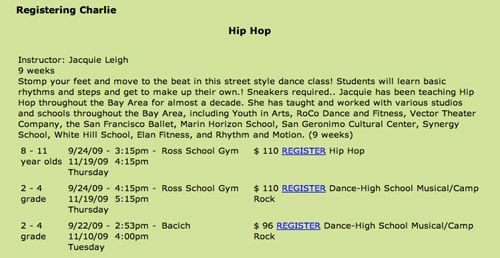 You can continue to register for other programs. In the case of a family with multiple children you can change the child that you are registering and register your other children for their programs. When you are finished registering for programs you can easily check out and pay for all the programs at once. Once the payment process has been completed the class inventory is updated. Relevant Tools will automatically close off registrations when the maximum number has been received for a particular program. When a program is full an option to join a wait list is presented instead of the registration link. Online payments can be handled through an online gateway such as Authorize.net. Relevant Tools will set up the shopping cart and interface to your online credit card processing. No credit card information will be stored in your Relevant Tools database. Relevant Tools does not charge a per transaction fee and does not collect or retain the payments for your programs. The revenue collected is yours and Relevant Tools only charges for the one time setup and monthly flat service fee that is bundled into your Relevant Tools VIP account. Please contact us if you would like to learn more about how to get started using Relevant Tools Online Registration. We can take care of everything for you so you can focus on running your programs, conferences or events.